Connect your SATA Hard Drive or Blu-ray/DVD/CD-ROM Drive to an IDE motherboard. 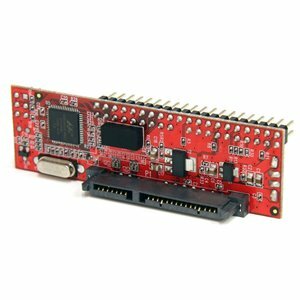 The IDE2SAT2 40-pin IDE to SATA adapter enables you to connect a SATA I/II/III drive to an available IDE/ATA 33/66/100/133 motherboard port - a cost effective solution that allows you to add newer SATA drives, and keep your existing motherboard.The IDE/SATA adapter offers a cost-effective solution for bridging the gap between a newer 2.5"/3.5"/5.25" SATA drive and older IDE motherboard port. The IDE2SAT2 also features ODD (Optical Disk Drive) support, allowing you to a add Blu-ray, DVD, or CD-ROM drives to an older IDE motherboard.